This track links Colonial Knob South with Spicer Forest on the northern side of Track Palace. This track is well signposted off the route up to Colonial Knob from the Spicer Forest car park. 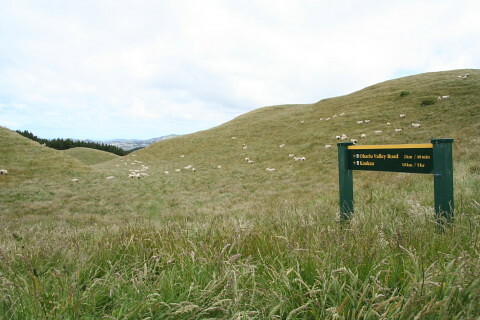 It is also part of the Te Araroa walkway. However, the track through the forest, although reasonably well marked with orange posts, is steep and very slippery after wet weather. Hopefully over time it will be upgraded to be of the same standard as the Colonial Knob and Spicer forest tracks. The track does provide some interesting options for variations from the Colonial Knob route. Signposted off the Colonial Knob South track about halfway up. There are no signposts in the Spicer Forest track - the track emerges in the wide grassy clearing a little way south of Track Palace. First timers either use a GPS or take the route from Colonial Knob walkway. NOTE that access to Spicer Forest ridge-line is currently closed to the public - see notes on Spicer Forest track page. A temporary alternate route for the Te Aroha walkway section has been marked leading down the Ohariu valley floor section of Spicer Forest. There are a number of stream crossings and beware of stinging nettle on this route. Slippery when wet. Whilst mountain bikes are allowed on Spicer Forest track, they are not permitted on Colonial Knob walkway. Motorbikes and dogs prohibited.